No matter where in the world you may be, finals season is one of the most stressful, sleep-deprived times of a college student’s life. And it wasn’t very different at HKUST (jokingly referred to as “Hong Kong University of Stress and Tension.” But in order to survive the stress, we came up with some great diversions. So join me as finals and shenanigans ensued. Still high from our amazing trip to Taiwan, getting back into the studying mindset right before finals wasn’t the easiest thing in the world. So I procrastinated with chores like every good college student has. Wednesday was spent doing laundry and preparing for my first final the next afternoon, and at noon I took my “Marriage, Kinship, and Cross-Cultural Perspectives” final. It turned out be a cinch, which was a huge relief to everyone. One down, three to go and that night, a woman living in Kowloon and auditing the class (she’s originally from the US but was living abroad for her husband’s job – my dream), invited us over to her very nice home not too far from campus to have a little celebratory “hurrah, we’re done with the course” dinner. And I tell you, Sandra pulled out all the stops for us. When we arrived she popped open two bottles of Bollinger champagne and we sat out in her gorgeous little backyard enjoying the weather and relaxing. When we all went inside for dinner, she had prepared a Western feast! There was leg of lamb, rotisserie chicken (my favorite! ), mozzarella caprese salad, Caesar salad, hummus and babaganoush and pita, corn salad, tabbouleh and tatziki! It was SO good! Then for dessert, espresso and Haagen-Dazs ice cream with strawberries for everyone. So perfect. And a true reminder of what I was missing at home. Up until then, it had been easy to forget what wasn’t readily available to me, but this brought a small pang of homesickness. 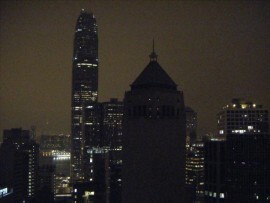 Another great shot of Hong Kong’s skyline from one of the club’s balconies in LKF. 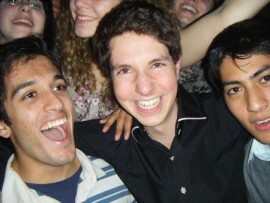 One of my favorite pictures on our nights out. The joy is so pure and unmatched. Friday, I got up after getting about four hours of sleep (I should mention the last week of the semester, I got close to no sleep – there was too much to try to pack in), and went to an experience called, “Dialogue in the Dark.” The premise is the same as the one in the US: you experience what it would be like to be blind and do everyday things – ride a boat, use the MTR, go to a market or a movie snack counter, etc. We were all given the white canes that the blind use, and then our guide (an actual blind person) led us through a pitch black maze of everyday events and we experienced what it would be like to not have any sight. It was an eye-opening experience (no pun intended)! I cannot tell you how thankful I am now to be able to see, and how different life would be without the gift of beauty that is granted to me each day by my eyes. Since then I’d been studying for my second final, which was at 8:30 Monday morning (ugh) and getting caught up. After the following Wednesday I would officially be done with finals, and still have six whole days to explore as much of Hong Kong as possible before being forced (under duress and an impending summer internship) to return to the States. 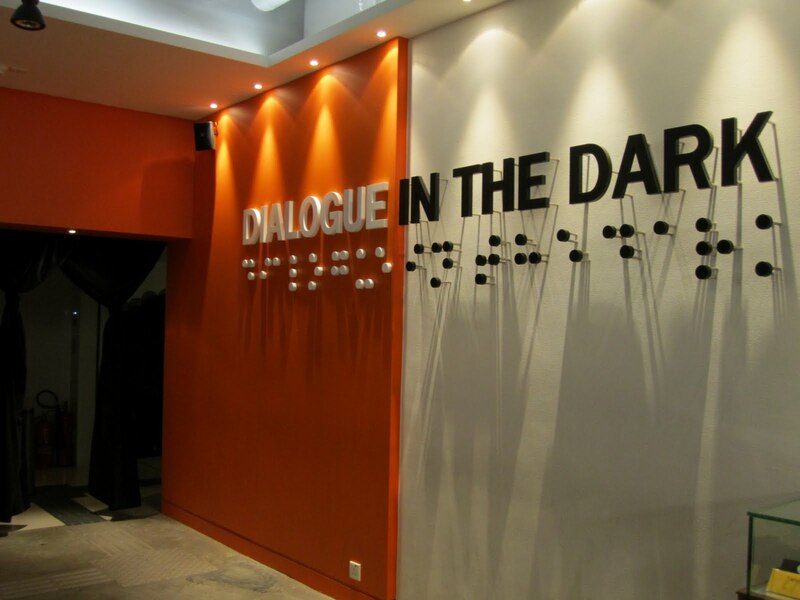 Entrance to Dialogue in the Dark – the last thing we saw before we went blind. I knew that some people were ready to go home, but I still wasn’t. I loved Hong Kong and I was still having too much fun to want to leave just yet. Too bad I wasn’t able to score an internship there for the summer like a few of my lucky classmates. Stay tuned for my next blog, Abby turned 21 in style and I visited my first Asian nunnery. Plus more finals – those too. More soon! This entry was posted in Asia, Hong Kong and tagged Asia, Club, Dialogue in the Dark, Finals, HKUST, Hong Kong, LKF, Test, Travels on May 9, 2014 by Paige N..